All over the world people make houses from whatever materials are available. Open your front door to find the similarities and differences in housing structures around the world. 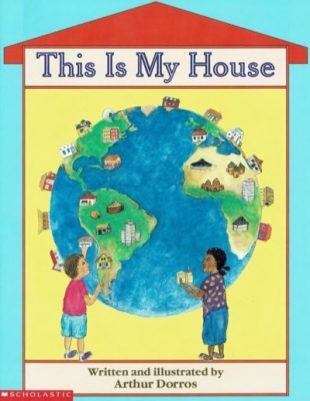 As you read about the different dwellings, you can learn how to write and say “This is my house” in 17 languages. Whether houses are big or small, on water or land, the people who live in houses make them their homes. I started out building small huts from branches and leaves, my own ‘houses’ just big enough to crawl into, when I was just a few years past the crawling stage. When I was old enough to handle a few tools, I built tree houses in a couple of huge willow trees behind our house. My brother, sisters, and friends would climb up there too. A box on a rope to haul things up and down or between the trees, was the most advanced technology attached to those tree homes. But I found I liked building places to be. When I began working, some of my first jobs were as a laborer and carpenter’s helper on construction sites around Washington, D.C. We didn’t work on the White House, but I learned a lot about how houses were put together, as well as a few things I didn’t expect from some of the older construction workers, one of whom specialized in weird nailing techniques. After a few summers learning the basics, I started taking on construction jobs by myself, with friends or occasionally with my brother. Most of what we built seemed to stay in place. I continued to work building and fixing up houses for many years. Then on one remodeling job, several children started swapping stories with me, and partly out of that experience grew my idea to put together my interests in books, writing, drawing, and storytelling to make picture books.